There’s a great snapper bite happening in Fort Lauderdale this week. 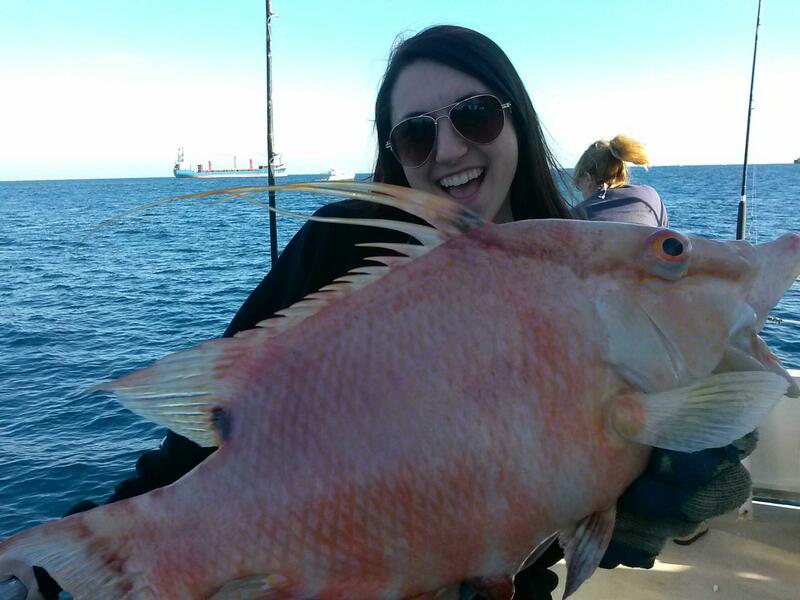 Mangrove snappers, yellowtails, mutton snappers, hog snappers and more are biting on our daily drift fishing trips and night anchor fishing trips. On the day trips, we’re catching them fishing the bottom with a half a plug of a cigar minnow. A 2 ounce lead and a 3-4ft leader is getting the best bite. Using this rig, we’re catching some nice mutton snappers, a few big yellowtails and mangroves and the occasional hog snapper. We’re also catching some porgies, grunts, triggers, margartes and other bottom dwellers. Groupers will also take this bait, but they are not in season right now. Daytime action is very good on our drifting trips this week. Night fishing is the best time to go for snappers. 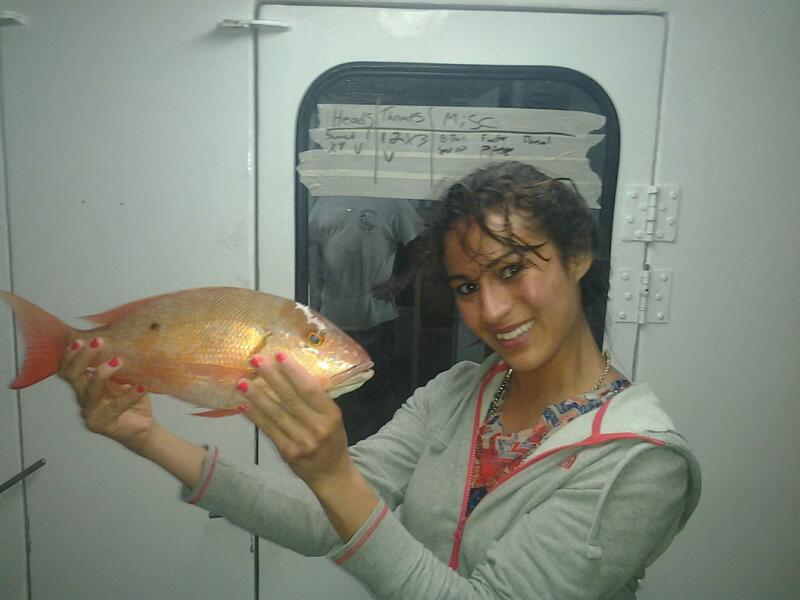 While snappers will bite good during the day, they are traditionally nocturnal feeders and they come out of the woodwork to feed on our night anchor trips. They throw caution to the wind at night and come out of their holes to hunt for prey. Squid is usually the best bait to use at night for snappers. You can catch bigger snappers using a single hook rig with a longer leader, but a chicken rig is best for catching the most numbers. A lot of the yellowtails we catch in the winter are small ones… about half are keeper size ones and half are throw-backs. The ‘tails are beginning to grow though as more and more larger yellowtails are hitting the deck each night. The mangroves we catch this time of year are very large, as are the muttons. 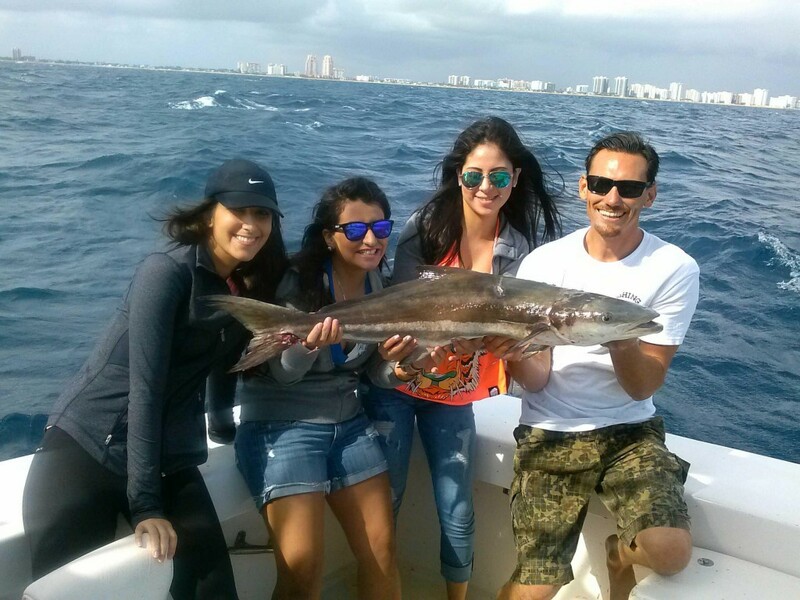 Our daily drift fishing trips aboard the Catch My Drift are catching good action on the Fort Lauderdale reefs. Snappers are biting exceedingly well. Yellowtails, mangroves and a few mutton snappers are making up the majority of the catch. 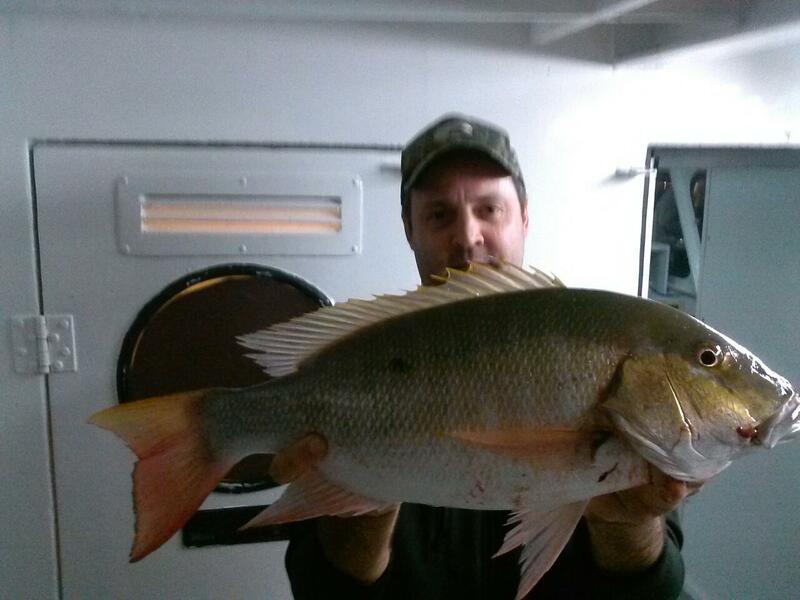 A few other kinds of snappers such as lane snapper, dogtooth snapper and mahogany snappers are also biting a bit. We’re catching most of our action fishing the bottom in about 85-120ft of water, just outside and just inside the reef. There isn’t a whole lot of current, so 2-3 ounces of lead will get you to the bottom. Cigar minnows or chunk squid are getting the best bite as bait. 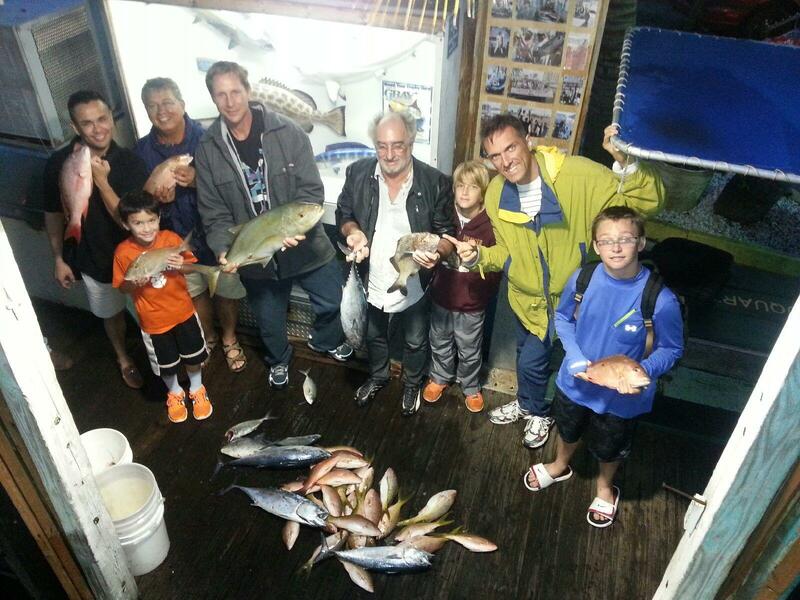 Besides snappers, we’re also catching a lot of Porgies, small groupers, triggerfish, grunts and jacks. 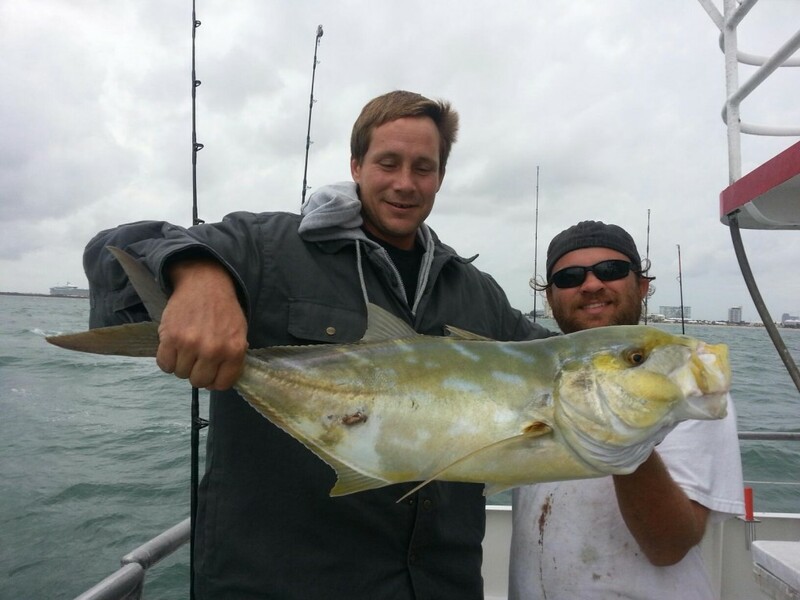 African Pompano are also biting for us good this winter fishing season. They are usually a very rare catch, but this year, they are biting quite often. Probably because there is so much more available bait with the lack of kingfish around. Night anchor fishing for snappers is also going well. 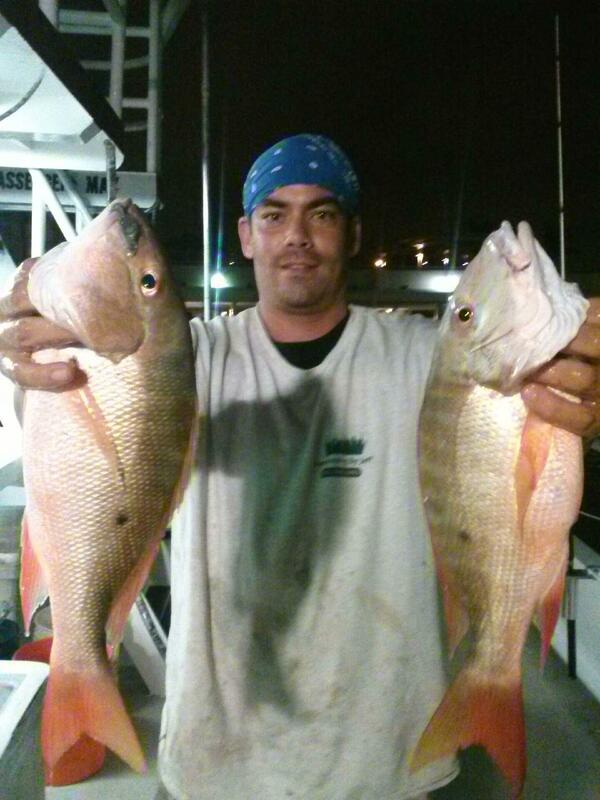 Some nice size mutton snappers are biting good on our night anchor trips as well as some big mangrove snappers. There are yellowtails biting at night too, but many of the night yellowtails have been small (throwbacks). A few small groupers (hinds and strawberries) are biting on the bottom as well as the usual culprits… jacks, blue runners, Cuban night sharks, porgies, grunts and triggers. All in all the night trips have been getting some pretty consistent action out there. Good luck if you’re drift fishing this week. Catch ’em up! The fishing during the Christmas holiday was surprisingly good. This is usually a tough week for fishing with all the boats fishing out there. It makes for a lot of competition for fish. Contrary to my expectations for a slow week, we actually did very well. There were a few sailfish caught, a couple monster hammerhead sharks, some scattered mahi-mahi and tunas, a few wahoo and lots of snappers biting on the bottom. It made for a lot of variety in our catches, depending on whether our customers wanted to go after edible fish, action or big game. Wahoo bit really good for us during the couple days surrounding the New Moon. Wahoo are very dependent on the moon phase and bite particularly well during the new moon and full moon phases. This is most likely because those are the times when we get the largest tide changes through our waters. 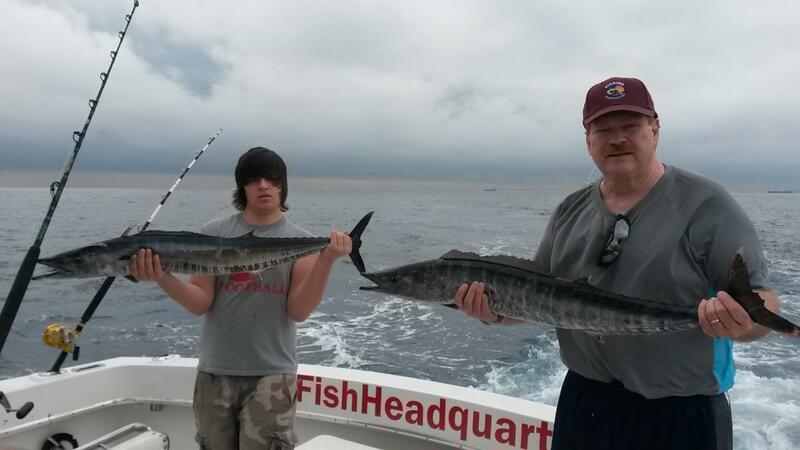 Several large wahoos were caught on those days including this double header wahoo caught by Tim and his son. Tim had a great day with a double wahoo, 2 mahi-mahi a 15 pound blackfin tuna and several bonitos. The sharks are here early this year! 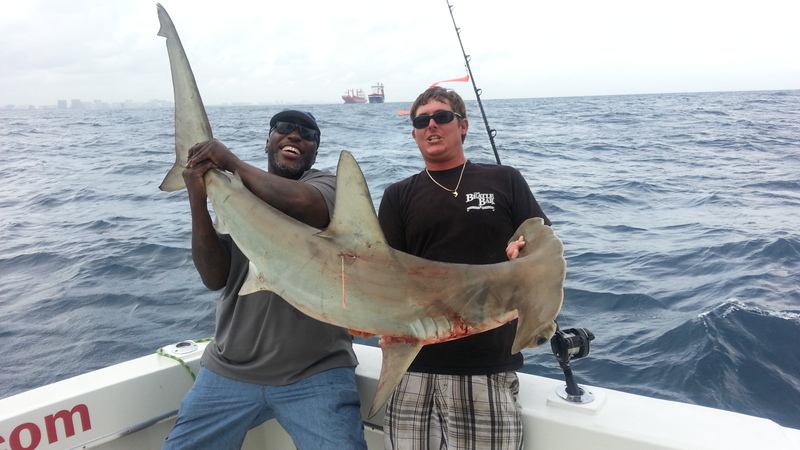 A few nice hammerhead sharks were caught this week on our sportfishing charters. The shark season usually doesn’t start getting productive until February, but this year it seems to have started early. 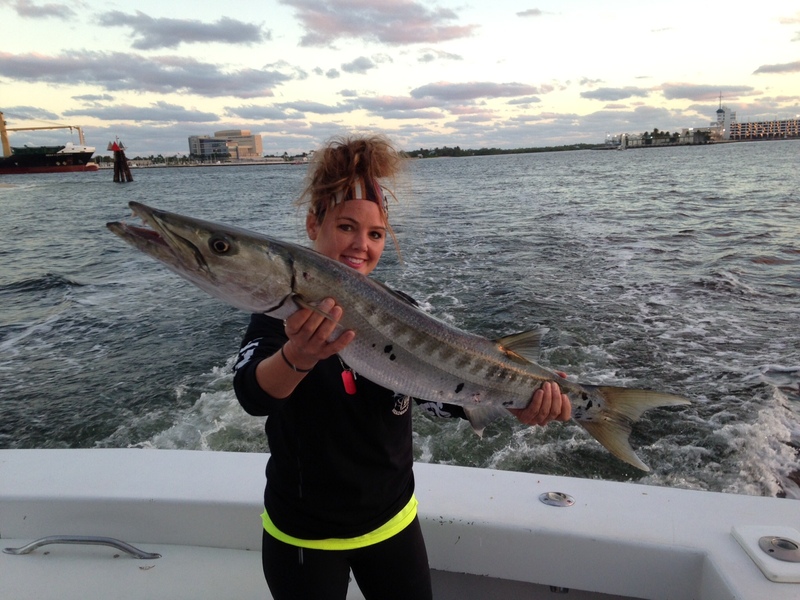 February through late May is prime time to go out and do a shark fishing charter with us. 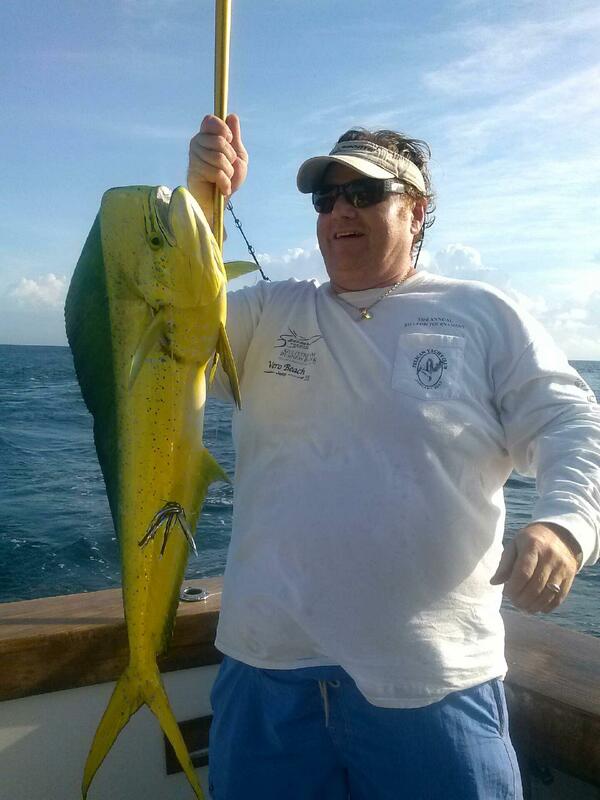 Snappers and groupers are also biting on the bottom and have been giving us the best action on our trips. 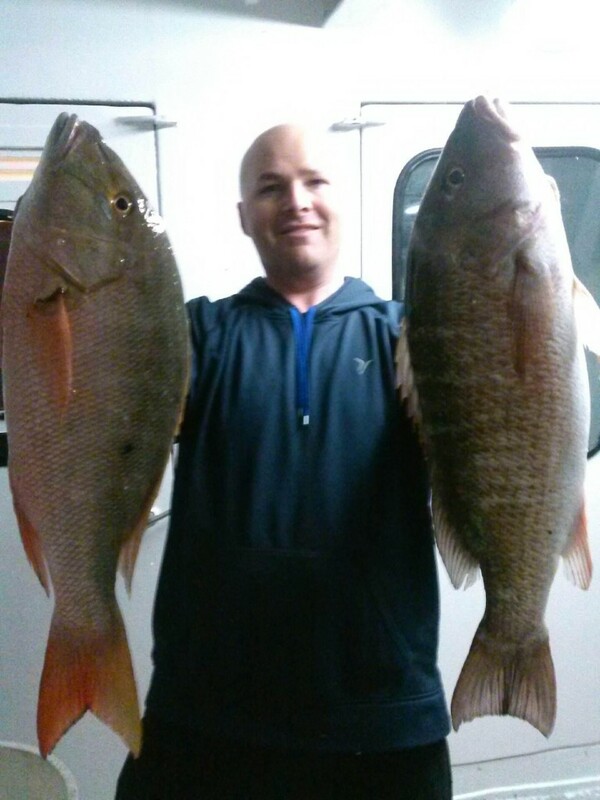 Snapper fishing is a lot of fun because we drop multiple hook chicken rigs down, baited with squid, and we can catch them 3 or 4 at a time. It’s a quick way to fill the box with some good eating fish. 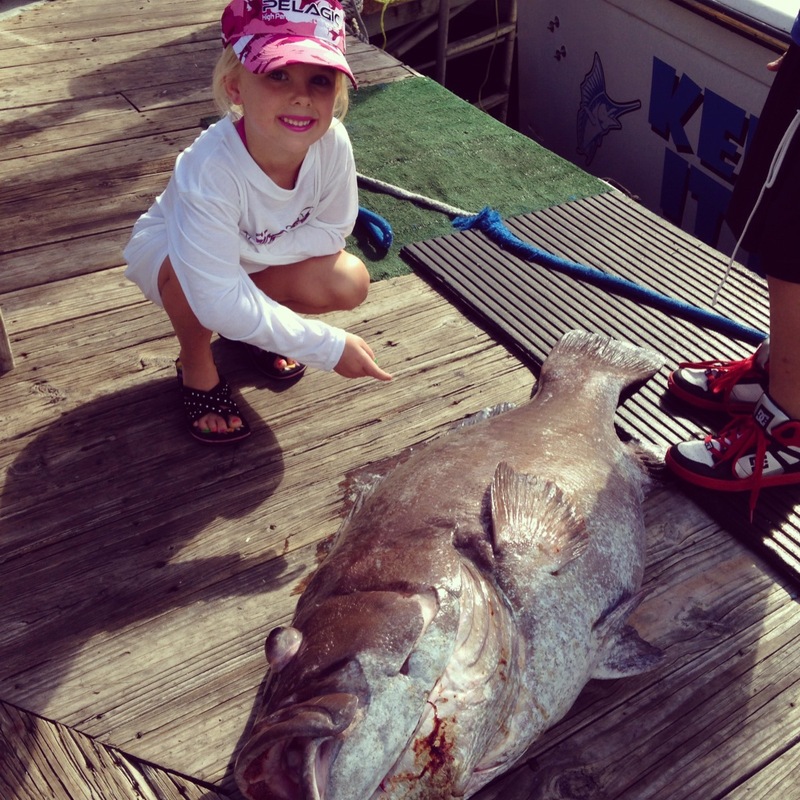 You can even get lucky can catch a monster such as that big warsaw grouper at the top of this posting. A few cobia are also biting and can be caught when doing some deep dropping around these shipwrecks. All in all, it’s been a great week of fishing with a lot of really good trips. Of course we have some slow days too, it’s part of fishing. As we get deeper into January, expect the sailfish bite to improve a lot, more mahi-mahi to show up, wahoo action around the full and new moons, and more and more bottom fishing action. Good luck to everyone fishing out there and make sure to LIKE US on facebook to see what we’re catching every day. www.facebook.com/FISHINGHQ. Sea ya on the water.